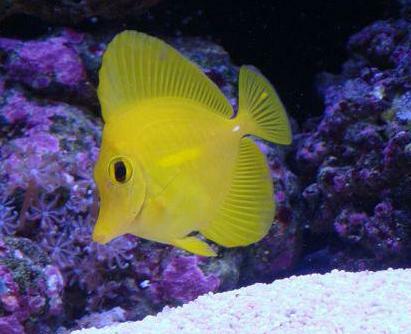 This is a yellow tang. This tang is certainly not my best friend, however it is certainly friendly. My tang, without me is useless, without my tang, I'd pretty much carry on as normal..
And thus he is :AMAzING:! Welcome Tang! I am currently awaiting pick up for the venture to buy two of Tangs cousins.. The Guppy and Tetra. For ADHD Fish (The only Guppy in my Tank) although very colourful is in need of companionship, so to the LFS I go! And although the very shiney neon tetras are exquisit in keeping the other Tetra (Little Fish) ammused, he to needs a friend of his own kind....AH!!! THE LADY IS HERE TO TAKE ME.. I GO!